To get a FREE But Honey Sticker you just need to fill out the form on their page. Get a FREE Justin’s Peanut Butter Cup or Squeeze Pack Sample! Pleas note, for this offer you will need to confirm your email address. They send out a mailed coupon. To get a FREE Personalized Video Messages From Santa click the create my video for free button. You can get a FREE Equate or Assurance Sample Of your choice here you just need to click on the 3rd bubble or wait until you see the free sample page to get the offer. 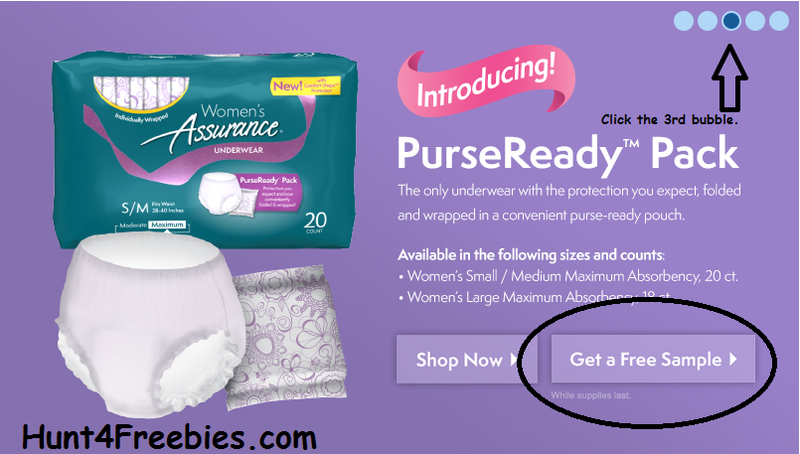 (Here is an image example of where to click) Once you see it click “get free sample”. Get a free sample pack with tons of products to try. Just fill out the form to submit your request. Some conditions apply so make sure you read through all the details on the site. For a limited time if you purchase a $25 Denny’s gift card you will also get a $5 off coupon. Claiming this offer takes a few steps. First, you must visit a Raising Canes location and ask for Caniac Club Card. Then take the card they give you and proceed to the link below to register your new card. Once you’ve done that you should get an e-mail letting you know that a free combo meal has been loaded onto your new card. Fetch Fuel is a glucosamine and omega-3 joint supplement for dogs, and you can currently request a free sample of it here. The Democratic Congressional Campaign Committee is offering these free “Stop Bigotry” stickers with a picture of Donald Trump on it. First select which store you’d like to redeem this offer at, then proceed to the next page where you enter your birthday and cell phone number. Within a few minuets you should receive a text message with a link to a coupon for a free Coke Zero. Later, if you wish to stop receiving text alerts simply reply to one of them with “Stop”.